ARMS: Argent, on a saltire azure two ostrich feathers in saltire Or, in the middle chief [sic] an inescutcheon gules charged with a Crown of Charlemagne of the third. CREST: Out of a crest coronet Or a cardinal bird wings elevated and addorsed proper. SUPPORTERS: Two griffins segreat wings elevated and addorsed Or clawed [sic] and langued gules. A description of the symbolism is available at the Fredericksburg, Virginia, website. I have no blazon, but does it really matter? Color on color, and not only metal on metal but argent on argent. The Spotsylvania County website makes no attempt to describe the seal. In fact, you need to search for it to even find it anywhere besides the footer image. Devised in 1968 by the College of Arms and presented to Loudoun County officials by then-Rouge Dragon Pursuivant Conrad Swan, the arms are based upon the arms of John Campbell, 4th Earl of Loudoun, Governor General of Virginia (1756-1759). Loudoun County was established in 1757 by breaking from Fairfax County. The current flag of the county is a banner of the arms, and the county website briefly discusses the history and symbology of the arms. I am pleased to note that while the website used to describe the ermine gyrons as white with stalks of wheat, an email I sent to the county some time ago has led to corrections in the description. I believe the blazon is Or, three bars gemel gules, a lion rampant sable overall, but I haven't found any definitive source. Fairfax County was formed in 1742 from the northern sections of Prince William County, and was named for Thomas Fairfax, 6th Lord Fairfax of Cameron, who was the proprietor of the Northern Neck. Lord Fairfax is also believed to have been the only Peer to have maintained residence in the Colonies; other Peers maintained offices in the Colonies, but returned to Great Britain after concluding business. The Fairfax arms are in 1st and 4th quarters, and the Colepeper (Culpeper) arms (Argent a bend engrailed gules) are in 2nd and 3rd quarters; Thomas Fairfax, 5th Lord Fairfax of Cameron, married Catherine Culpeper, the only legitimate child (and therefore heraldic heiress) of Thomas Colepeper, 2nd Baron Colepeper. The heraldry seems to have quite a UK influence in its creation Jeremy. Well, it is Virginia, the oldest of the Colonies. Everything I've posted so far is from areas created prior to the Revolution. I'll look around and see if I can find something post-Revolution. I didn't realise Jeremy that their would be so much heraldry around the early colonies at that time. Thanks for sharing this. Oh, yes. Many proprietors of the Colonies, if they weren't Peers they were at least armigerous. One of the most famous of these proprietors were George and Cecilius Calvert, 1st and 2nd Lords Baltimore, whose arms were Calvert (Paly [of six] Or and sable a bend counterchanged) quartered with Crossland (Quarterly argent and gules a cross botonny throughout counterchanged). George Calvert is widely regarded as the founder of Maryland, although he died five weeks before the charter was signed. The flag of Maryland, adopted in 1904, is a banner of these arms. ARMS: Azure a cross pattée throughout gules fimbriated argent overall a flowering dogwood blossom proper. CREST: Upon a grassy mound an anchor palewise sable fouled of a holly branch leaved and fructed proper. SUPPORTERS: Two cardinal birds on evergreen branches all proper. Staunton is an independent city within the confines of Augusta County. Within the Commonwealth of Virginia, any city, e.g. Staunton or Virginia Beach, is completely fiscally and politically independent of any county, while towns and villages, e.g. Bowling Green or Herndon, rely in part on county services, such as law enforcement or public education, while maintaining their own fiscal and political independence in other matters. 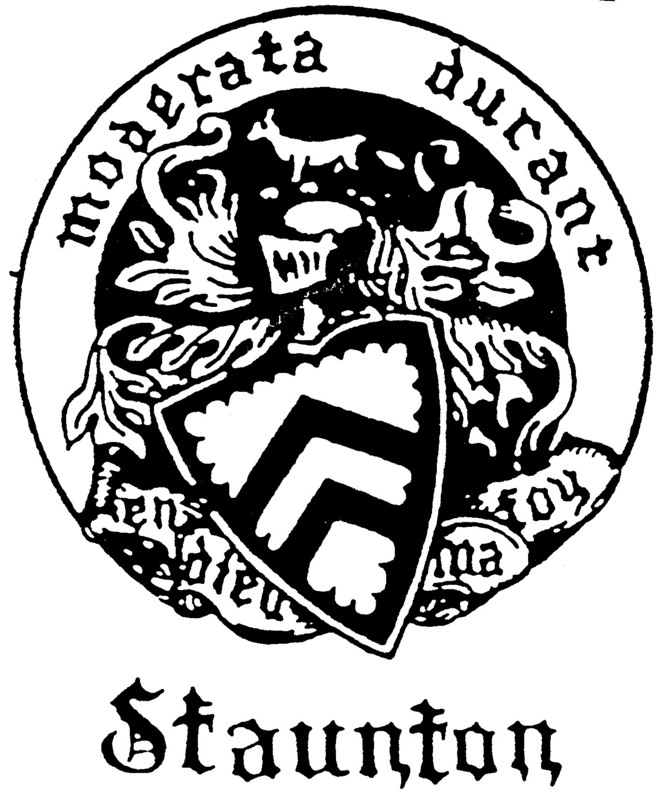 Joe McMillan provided the following information to CRW Flags regarding the flag of Staunton: The arms on the center of the flag are those of Lady Rebecca Staunton, for whom the city was named: Argent two chevrons within a bordure engrailed Sable; for crest, a fox statant proper; the mottoes (above the shield) Moderata durant and (below the shield) En dieu ma foy. The arms were adopted by the city on 22 January 1926. (Source: Staunton City Code 1985, Â§1.05.160). Jeremy Kudlick wrote: Within the Commonwealth of Virginia, any city, e.g. Staunton or Virginia Beach, is completely fiscally and politically independent of any county, while towns and villages, e.g. Bowling Green or Herndon, rely in part on county services, such as law enforcement or public education, while maintaining their own fiscal and political independence in other matters. That is because the county seat was already established before the city became independant. For example, the City of Fairfax was granted independent status in 1961, long after the courthouse and other county buildings had been established. The Fairfax County Courthouse continues to be located in the City proper, but the actual seat was eventually relocated to its current location in the surrounding unincorporated area also known as Fairfax. Likewise, the Prince William County Courthouse is located in the City of Manassas which was granted independant status in 1975, but the actual county seat was relocated to a larger building in an unincorporated area of the county at a later date. As independant cities within Virgina go, Staunton is realtively old, gaining its status in 1902. J Duncan of Sketraw wrote: I didn't realise Jeremy that their would be so much heraldry around the early colonies at that time. Thanks for sharing this. English heraldry has a lasting influence in Maine, as well. Jeremy Kudlick wrote: Joe McMillan provided the following information to CRW Flags regarding the flag of Staunton: The arms on the center of the flag are those of Lady Rebecca Staunton, for whom the city was named: Argent two chevrons within a bordure engrailed Sable; for crest, a fox statant proper; the mottoes (above the shield) Moderata durant and (below the shield) En dieu ma foy. The arms were adopted by the city on 22 January 1926. (Source: Staunton City Code 1985, Â§1.05.160). I've since learned that the city was mistaken in attributing these arms to Rebecca Staunton (Lady Gooch, wife of Sir William Gooch, Bt, who was lieutenant governor of Virginia 1727-49). They actually belonged to a different Sta(u)nton family. Her arms were Vairy Argent and Ermines a canton Gules, as engraved on a paten and caudle cup she left in her will to the chapel at the College of William and Mary. The arms are derived by reversal of tinctures from those of Lt. Col. Alexander Spotswood, Lieutenant Governor and Commander in Chief of the Colony and Dominion of Virginia, 1714-22, for whom the county is named (-sylvania = "wood, forest"). His arms were Argent on a chevron Gules between three oak trees eradicated Vert a boar’s head couped Or. They are engraved on a silver tea caddy that belonged to him and are included in both Fox-Davies's Armorial Families and the NEHGS Roll of Arms (entry #31). Too bad the county didn't change the boar's head to a color while they were reversing the colors of the field and chevron.